I'm pretty positive many of you already know about this genius pancake recipe, but I didn't want anyone to think I had completely forgot about my feeding the littles series! So here I am...showing up with one of the easiest recipes ever to say, I haven't. If by chance you haven't heard of these pancakes, your life will forever be changed in the best way possible. These pancakes are kid approved and mommy approved! Mommy approved because they are so quick to make that my life is easier because of them and because they are healthy for me to eat, too! Camden loves these pancakes and one batch usually makes enough that I have breakfast for him the next day as well. Does anyone else make these pancakes for your kiddo? They are a weekly thing in our house! Happy Thursday friends!! PS: Got to hear Baby K #2 heartbeat yesterday! Always the best! I still need to try these! I have some bananas that are on their way to brown...so maybe this weekend! thanks for sharing! I make these for my little guy because he has a milk allergy and can't have most other pancakes out there. He loves these! I add cinnamon to ours. soooo can I make these for myself!? they look so good! Will be making these for Harper this weekend! having a gluten allergy i make these all the time! These are a favorite in our house too! You can also do this with a sweet potato (well technically a yam, the ones that are orange...ha!) as well and I think they turn out even better, more like real pancakes. I'll usually take one larger sweet potato, bake it in the oven, take off the skin, and then will add anywhere from 5-9 eggs depending on how big the potato is and I try to make the batter pretty thin. 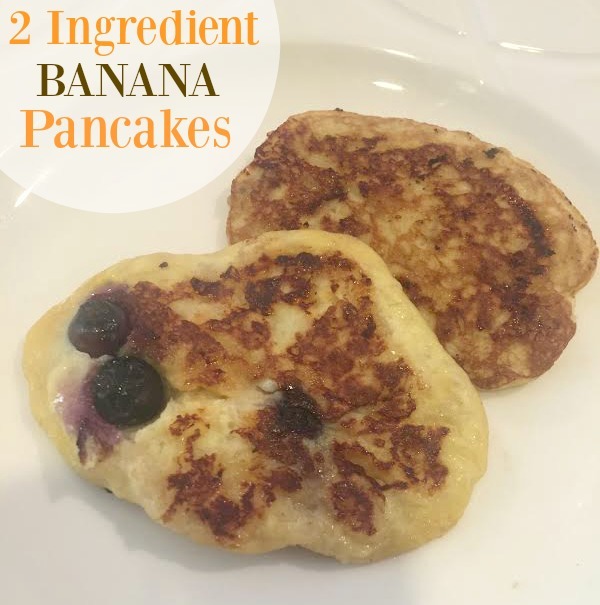 It makes a ton of pancakes and is such a perfect breakfast or snack for him throughout the week! YUM!!!!! I'll definitely have to try these! I have tried these before but never thought about adding fruit in! Thanks for the great idea. I'm going to try them for my little guy! Genius! I am terrible at cooking pancakes but these seem like they would be fairly foolproof.